Welcome to the Premier College Soccer portal that teaches players how to Master The Fundamentals of the College ID Process. Parents can view their child’s progress. Players maximize thier opportunities with college coaches. iSoccerPath’s programs are approved by youth clubs, leagues and state associations throughout the United States. 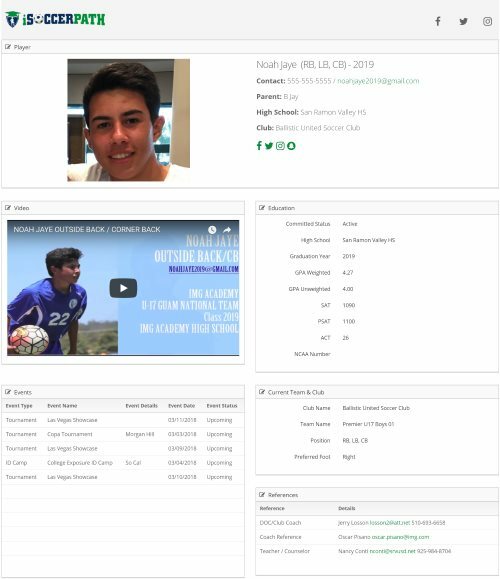 iSoccerPath is a unique program for players and their parents, run by college soccer parents, high school counselors and current and former college soccer coaches. The iSoccerpath program guides parents and players over the course of their high school years to best position them to become a student athlete at the collegiate level. Visit isoccerpath.com to learn more..